It’s 2015, but we still don’t have time-travelling cars. However, another gadget from the Back to the Future films is within reach: the hoverboard. American startup Arx Pax raised $510,590 on crowdfunding website Kickstarter in December for its Hendo hoverboard, with plans to ship the first in October to 11 backers who each pledged $10,000 for one of the first. The device uses magnetic-levitation technology: four disc-shaped “hover engines” induce an opposing magnetic field in a special surface, enabling the Hendo to hover an inch above the ground. Hundreds more people pledged between $299 and $949 on Kickstarter for Arx Pax’s “whitebox” developer kit, which includes a set of hover engines and enough surface to hover on. The idea is that they’ll be able to explore Arx Pax’s patented “magnetic field architecture” (MFA) technology, and perhaps make their own devices. “We made a conscious decision to go ahead and put it in everyone’s hands, and put it out there as far and wide as possible. This is a new tool for humanity. We can solve a lot of problems with this technology: it’s an obligation to share what we’re doing with the world.” Within Arx Pax, Hendo Hover has been given a clear brand identity. Henderson says the company won’t be hovering skyscrapers in the immediate future, but suggests smaller-scale applications like the ability to flip a switch to levitate computer servers or even wine racks – the August 2014 earthquake in South Napa, California cost vineyards an estimated $80m – as being closer. 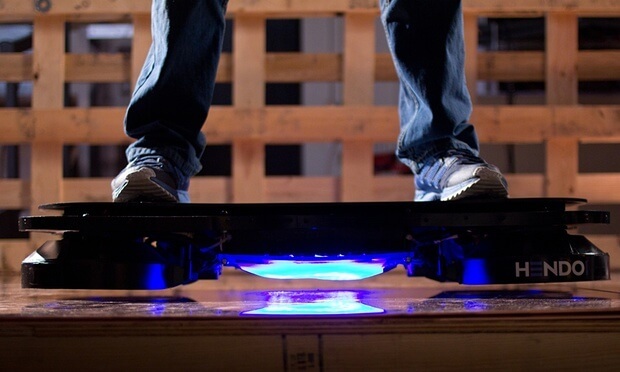 In the meantime, there’s a hoverboard to finish and ship.